Muzzle of Bees has assembled a backyard BBQ at SXSW 2011. The party is free (but does require an RSVP) and includes free beer and barbecue. It takes place at 3217 1/2 Hampton Road and the lineup includes Josh T. Pearson and Great Lake Swimmers. 3217 1/2 Hampton Rd – Noon – 7 p.m.
One Hundred Flowers – 12:30 p.m.
Yellow Ostrich – 1:00 p.m. 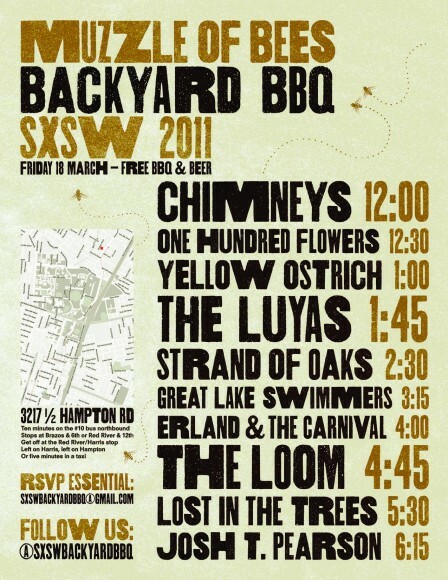 The Luyas – 1:45 p.m.
Strand of Oaks – 2:30 p.m.
Great Lake Swimmers – 3:15 p.m.
Erland & the Carnival – 4:00 p.m. The Loom – 4:45 p.m.
Lost in the Trees – 5:30 p.m.
Josh T. Pearson – 6:15 p.m.